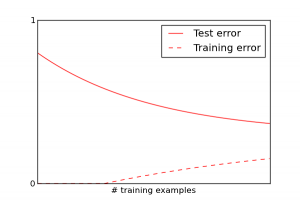 When we talk about priors and regularization, we often motivate them in terms of “incorporating knowledge” or “preventing overfitting.” In a sense, the two are equivalent: any prior or regularizer must favor certain explanations relative to others, so favoring one explanation is equivalent to punishing others. But I’ll argue that these are two very different phenomena, and it’s useful to know which one is going on. 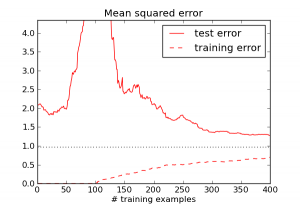 This is more or less what happens if you are using a good and well-tuned learning algorithm. Algorithms can have particular pathologies that completely distort this picture, though. Weird — the test error actually increases until \(N\) roughly equals \(D\). What’s going on? The effect disappears! 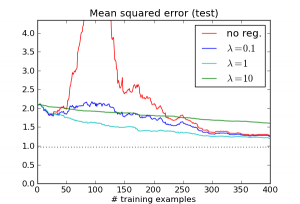 While the different \(\lambda\) values occupy different points on the overfitting/underfitting tradeoff curve, they all address the basic issue: the regression algorithm no longer compulsively tries to match every example. 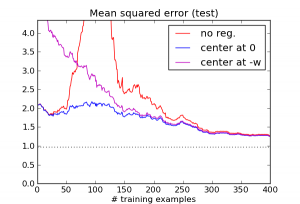 This is indeed a lousy regularizer, and for small training set sizes, it does worse than having no regularizer at all. But notice that it’s still enough to eliminate the pathology around \(N=D\), and it continues to outperform the unregularized version after that point. Based on this, I would argue that for linear regression, L2 regularization isn’t encoding knowledge about where good solutions are likely to be found. It’s encoding knowledge about how the algorithm tends to misbehave when left to its own devices. Usually, priors and regularizers are motivated by what they encourage rather than what they prevent, i.e. they “encourage smoothness” or “encourage sparsity.” One interesting exception is Hinton et al.’s paper which introduced the dropout trick. 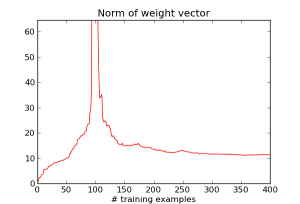 Consider the title: “Improving neural networks by preventing co-adaptation of feature detectors.” Co-adaptation refers to a situation where two units representing highly correlated features wind up with opposing weights. Their contributions wind up mostly canceling, but the difference may still help the network fit the training set better. This situation is unstable, because the pair of units can wind up behaving very differently if the data distribution changes slightly. The dropout trick is to randomly turn off 50% of the units on any given iteration. This prevents co-adaptation from happening by making it impossible for any two units to reliably communicate opposite signals. Next time you try to design a prior or regularizer, think about which you’re doing: are you trying to incorporate prior knowledge about the solution, or are you trying to correct for the algorithm’s pathologies? Disagree entirely. 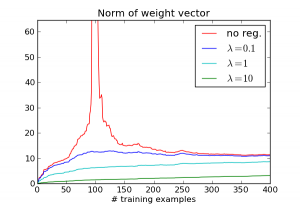 If we interpret the regularization as a Guassian prior over the weights, regularization around -w represents a Gaussian prior with mean -w. No regularization represents a uniform prior, or, if you prefer as I do to think about a proper prior, a Gaussian prior with extremely large variance. The prior with mean -w but with the reasonable covariance matrix lambda*I assigns much more probability to the region around w than the prior with extremely large variance. So -w is not an example of misleading prior knowledge; actually it is very good, very specific prior knowledge compared to the uniform prior. Next Next post: Which research results will generalize?